In the modern medical community, cooperation is of the utmost importance in diagnosis and therapy, as doctors and patients work together to fight disease. In the past, doctors who worked alone had low efficiency and limited success in diagnosis and treatment, because no one helped them improve themselves. Since health care reforms have been put into effect, however, hospitals work as a big and united team. The diagnostician who figures out the cause of disease, the radiologist who takes X-rays, the orthopedic doctor who sets broken bones, and the nurse who takes care of patients--all these different medical professionals cooperate and assist each other in saving lives. In addition, cooperation between doctors and patients is the foundation for successful therapy, which may protect the interests of both sides. If doctors and patients understand, respect, and support each other, disease can be treated in a cheerful and soothing environment. Consequently, doctors, who don’t work alone any more, cooperate with different medical professionals and patients to fight disease, which helps to make the modern medical community more peaceful. As we can see from the picture, the doctors are examining the patients with some medical tools in the hospital. Through these practices, doctors can diagnose a patient's problems. Long ago, our ancestors used some simple ways to distinguish between diseases, but diagnosis has always been very important in the process of therapy. For example, 望闻问切 (wàngwénwènqiè; watching the face, smelling, asking questions, and feeling the pulse) are well known as methods of diagnosis in Chinese traditional medicine. With the development of science, these methods have been improved and have gradually become a bridge connecting basic medicine with clinical medicine, so they are the fundamental subject of all clinical medical courses. Modern diagnosis includes three parts: (1) systemic, careful and skillful inquisition into the symptoms; (2) physical examination (inspection/ palpation/ percussion/ auscultation and smelling); and (3) lab tests and examination with machines. Modern medical tools give doctors crucial information, because if can we master the diagnostic methods, we can give better services to the patients. As vividly displayed in this picture, cardiac physicians and patients both play an important role in reducing heart disease mortality. According to the World Heart Federation, among three deaths worldwide, one person’s death is caused by cardiovascular (心血管) disease. That terrible number shows why the contribution of cardiac physicians is so important. First, emergency measures must be taken rapidly to save patients’ lives. If patients are rescued successfully, then doctors prescribe medication to prevent the conditions from deteriorating. Doctors also take preventive measures in order to let the high-risk groups understand what the risks of cardiovascular disease are. The patients’ important role is to stay far away from risk factors. Four common reasons for heart disease are understood: the environment, tobacco, alcohol and genetic factors. People can avoid them (except heredity) and can also increase physical activity to keep healthy. In addition to these, cooperating with doctors is also important. In treating and preventing incidence of cardiovascular disease, physicians’ treatment can not be separated from patients’ self-awareness. Morning rounds, which includes a time of observation and discussion, are very important to doctors because they provide current information and ideas about the situations their patients are in. After making their rounds, the chief, the attending physicians and residents may gather around and discuss the cases and choose the best therapy plan. So, during the discussion time, there may be a lot of doctors in the office, and they can freely put forward their thoughts about the diagnosis and therapy. Then conclusions regarding the best therapy are drawn. The whole discussion may take half an hour or more. Therefore, doctors should pay close attention to morning rounds and take part on time; that way they find out what they need to know about their patients and can help their colleagues provide the best possible treatment. Nurses are playing increasingly significant roles in Chinese hospitals by performing basic duties in both the wards and operating rooms and through health education programs. Nurses are responsible for basic nursing care, which includes taking temperatures, oral administration of medicine and giving injections. 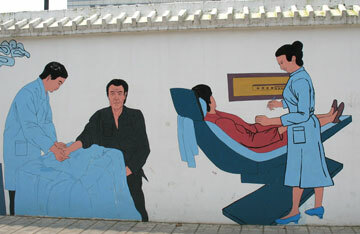 Nursing services are divided into four categories, based on a patient’s health condition: intensive care (caring for patients all day), first-class nursing (caring for patients every 15-30 minutes), second-class nursing (caring for patients every 1-2 hours) and third-class nursing (caring for patients every 3-4 hours). Nurses are also responsible for preparing various instruments before an operation and handing them to surgeons upon demand during the operation. Furthermore, nurses promote individual and group health by helping people to develop health consciousness and to cultivate healthy behaviors and lifestyles. 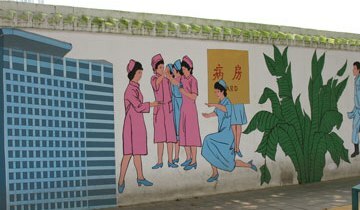 In summary, Chinese nurses not only do basic nursing and health instruction, which play a major role in hospitals, but also act as indispensable assistants in operation rooms. This picture shows several nurses going about their duties, including delivering medicine, reading a thermometer, and preparing tools to help doctors. Those wearing blue are normal nurses, and those wearing pink are pediatric nurses. The sign says “Bing fang”, meaning “ward”. Nursing is a fundamental aspect of modern medicine. Ancient nursing came from people’s instincts and was based on family needs or superstitions. Nursing in the middle ages was full of religious color. During the Renaissance, nursing was considered as an occupation more than a religious affair. Modern nursing developed in the 18th century. Florence Nightingale made a great contribution to the science of nursing, including the application of statistics to medicine and the beginning of formal nursing education in 1860. Thanks to her effort, the social status of nurses changed; nursing became an honorable profession. To show respect to Ms Nightingale, her birthday--May 12--was named International Nurse Day. Now modern nursing includes the promotion of health, the prevention of illness, and the care of both sick and well people (communities, groups, families, and individuals of all ages) in all settings. In recent decades, medical system innovation at Kunming Medical University’s #1 Affiliated Hospital has greatly increased the cure rate and improved patient satisfaction. First, the #1 Affiliated Hospital (the biggest hospital in Yunnan Province) was built in 1941 and currently has 1995 medical staff members (11 doctoral tutors, 287 master tutors and 86 expatriates). Most of the staff have earned a Master’s Degree or above. Twenty years ago, most had only a Bachelor’s Degree or Associate’s Degree. Thus, today’s highly qualified medical staff can give patients more accurate therapy. Secondly, important medical equipment has been replaced or improved in recent years. The introduction of a MRI and a PET machine has played an important role in diagnosing diseases. Thirdly, more emphasis has not only been put on the unity and spirit of collaboration among doctors but also on the interests of the patients. Therefore, better hospital administration has won the praise of patients. KMU’s #1 Affiliated Hospital’s skilled medical staff, high-tech medical equipment and satisfying hospital administration have provided a healthy and harmonious medical environment that meets the standards of China’s more advanced hospitals. 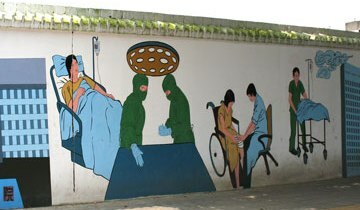 This part of the mural highlights the importance of sterile conditions in the practice of modern medicine. An antiseptic mentality is especially important because it is the key to the success of an operation. The development of aseptic techniques is considered basic to the development of surgery. In 1846, Doctor Semmelweis washed his hands with bleaching powder before surgery, which reduced the death rate (by 1-10%) caused by infection. Then Doctor Lister made efforts to decrease the rate (by 15-46%) by using carbolic acid to sanitize the operation equipment and soak the gauze. Since then, aseptic techniques have continued to develop. Today, the surgeon who holds an antiseptic mentality seriously and complies with the system strictly will doubtlessly be able to greatly reduce the infection rate; those who don't, risk the most terrible result: the patient's death. As shown in the picture, sterilized needles, germ-free bandages and blankets, and a disinfected operating theater are all part of the antiseptic mentality necessary for success in surgery and hospital care. What is the Emergency Room? The emergency room is a busy place where medical personnel must quickly intervene to save lives and handle accidents. Emergency treatment is urgent after accidents, can stabilize a patient’s condition, and plays a great role in rehabilitation. An emergency room is an indispensable department for every hospital. Common cases in emergency rooms include fractures, myocardial infarction, and shock. These cases often threaten patients’ lives, so doctors need to handle them quickly to keep the condition from deteriorating. Some key points should be emphasized when conducting emergency treatment, such as keeping the airway unobstructed, carrying out effective artificial respiration, and establishing active artificial circulation, and priority should be given to time. Doctors must inquire into the cause of disease or injury, grasp the patient’s condition, and swiftly take measures to save lives. In conclusion, emergency treatment keeps people alive in urgent situations, helps restore health after accidents, and calls for comprehensive skill and a quick mind. Emergency medical treatment (EMT) is a critical link between the public and the health care system. When people suffer from an accident, the emergency personnel immediately and skillfully treat the patient, using practical resources on the scene. The purpose is to save life, to stabilize patients and to help physicians to make a diagnosis and start treatment. When the patient is sent to the hospital, EMT personnel give doctors information about the patient’s initial complaint, vital signs, age, medical history, and resources used. This helps doctors make decisions about whether the patient should have other tests before they make a diagnosis and give treatments. In a large sense, on-the-scene life-saving Emergency Medical Treatment is the front door to the hospital's emergency department. Sphygmopalpation and Acupuncture Therapy, two classical forms of Traditional Chinese Medicine (TCM), continue to be used successfully for diagnosis and treatment both in China and abroad. Sphygmopalpation is also known as “feeling the pulse”. Its history can be traced back to 1,500 years ago when the systematic theory appeared in 《濒湖脉学》 (Bin Hu Mai Xue), written by Li Shizhen in the Ming dynasty. It is a vital TCM method of diagnosis that helps doctors understand the patients’ internal disease development by touching their pulse, for the pulse’s location, rhythm and effect can reflect the fundamental condition of the heart and arteries. Acupuncture Therapy, another classic TCM treatment therapy, includes acupuncture (针术) and moxibustion (灸术), dating back to《黄帝内经》 (Huang Di Nei Jin) 2,000 years ago. As methods of treatment, acupuncture and moxibustion act on nerve regulation by pricking and fumigating (respectively) certain acupoints on the body’s surface. According to a report from the Fifteen-year Anniversary of the International Acupuncture Association, these excellent TCM methods were being used in 142 countries by 2005. Sphygmopalpation (diagnosis by feeling the pulse) and Acupuncture Therapy (treatment by pricking and fumigation) not only continually contribute to Chinese people’s health, but these time-honored forms of TCM are becoming increasingly helpful in foreign countries as well. When doctors need to make a diagnosis they may utilize high tech instruments or may simply touch your pulse; modern techniques and ancient methods may be used side by side. In the old times, medicine was based on religious ideas and people's life experiences. Doctors used the medications passed from generation to generation to treat their patients. By contrast, modern medicine is based on a growing scientific understanding of how the body works and how microscopic things (e.g., viruses and bacteria) affect health. Modern diagnostic methods include biopsy, autopsy and experimentation. High-tech instruments are important because the doctor can't make an accurate diagnosis without reliable information. But the practice of modern medicine has absorbed some ways from traditional medicine. For instance, acupuncture still plays an important role in alleviating pain, and message (touch therapy) can help release the patient's anxiety. Thanks to the trend of combining modern medicine and traditional medicine, doctors are making steady progress in conquering disease. During China’s war of resistance against Japan, Dr. Henry Norman Bethune, a Canadian communist, made a great contribution to China’s liberation by treating casualties and civilians, and enhancing China’s medical level. In 1938 and 1939, this surgeon led his medical specialists to help Chinese people struggle against Japan by supplying numerous drugs and medical instruments. Without regard for his safety, he set up a mobile army surgical hospital near the front lines to provide timely emergency care and save casualties’ lives. Behind the front lines, Bethune lived harmoniously with local people and he supplied free treatment for the elderly, children, and the sick. 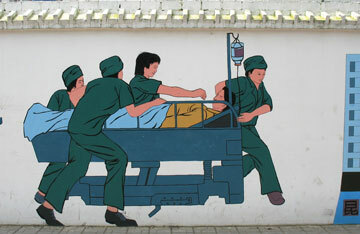 To reduce mortality rates, Bethune worked to enhance China’s medical level. He organized local people to make various medical instruments, gave classes to medical staffs, and compiled medical materials, cultivating capable medical workers. Dr. Bethune’s enormous contribution during China’s war of resistance against Japan, saving soldiers’ lives, caring for common people and improving the state of the medical care in China, has left a lasting legacy that is dear to the people of China. 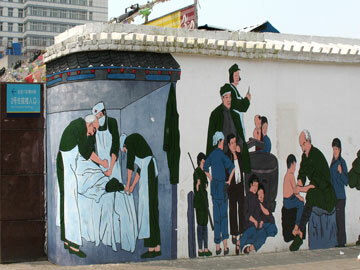 This part of the mural reminds us of the uncountable number of operations Dr. Bethune and other army medical personnel did to save Chinese soldiers and villagers' lives during the War of Resistance against Japan. Military doctors performed many miracles when helping Chinese people, including some operational records that can't even be broken now. Most primary school children are deeply moved when reading "In Memory of Norman Bethune," which is an introduction to this great man who was a member of the Communist Party of Canada. In this article, Chairman Mao writes: "What kind of spirit is this that makes a foreigner selflessly adopt the cause of the Chinese people's liberation as his own? 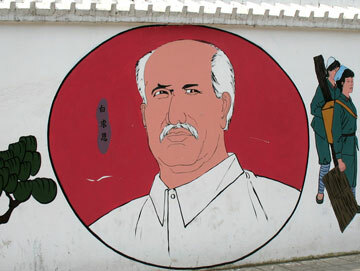 It is the spirit of internationalism, the spirit of communism, from which every Chinese Communist must learn." Even today, medical students can learn from Dr. Bethune's medical ethics. Medical ethics can not only affect a doctor's attitude to his patients, but also his medical skills. Modern China is not isolated from the rest of the world or from its own history; the spirit of internationalism and the medical ethics of historical figures like Dr. Bethune are still important to the practice of medicine in China. 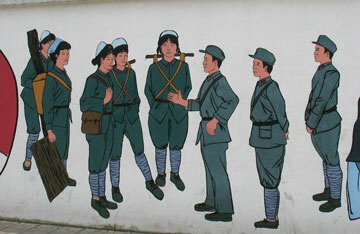 During the Anti-Japanese War (1937 to 1945), the Chinese army’s medical and health services team played an important role in healing the wounded and rescuing the dying. 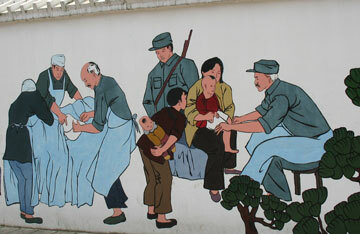 After the outbreak of the war, Chinese people had to fight against Japanese Imperialism for eight years, and the medical workers actively took part in the battles. The team members rushed to the battlefield to do first-aid, such as stopping bleeding, binding up wounds, fixing broken bones and transporting the injured to a base hospital in order to receive better treatment. At the same time, they taught soldiers how to administer life-saving emergency care to each other when they faced critical situations. Thanks to the contribution of this special medical community, the sick and wounded’s suffering was alleviated and their lives were saved so as to assure the army’s combat effectiveness. In an extremely difficult environment, military medics combined their knowledge and zeal to render and teach emergency care, which contributed to military readiness and helped China win the final victory in the Anti-Japanese War.  War is one of the world's most serious threats to health, and health care has always played a very important role in war, especially China's eight-year War of Resistance Against Japan (1937-1945). There were many great heroes in the ruthless battles, and countless people had to pay with their lives. Since wartime injuries were common, the doctors' main task became treating the injured soldiers and minimizing the damage. Many doctors were not afraid of sacrifice. They wore white coats in the field hospitals near the front lines. Hospitals and aid stations were frequently understaffed. Shabby houses became the operating rooms. In spite of medicine shortages and the lack of facilities, doctors saved many soldiers' lives under harsh conditions. Killing and healing are strange companions, but the Chinese people will always cherish the contributions made by heroic soldiers in the operating rooms—China's brave military medical personnel. Henry Norman Bethune (1890-1939) was a great doctor dedicated to serving humanity. In 1938, as a thoracic surgeon and member of the Canadian Communist Party, he came to China for humanitarian reasons to perform operations to Chinese soldiers. 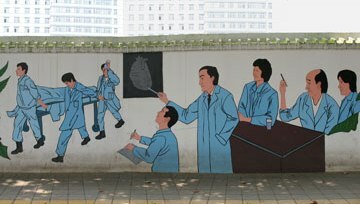 The Encyclopedia of World Biography (EWB) says: "In the rugged mountainous area west of Beijing,… [Bethune] constructed makeshift hospitals throughout the region, wrote textbooks on elementary medicine and surgery, and began training young Chinese in rudimentary medical techniques." Bethune's medical team was normally only a few kilometers from the front lines; indeed they were even behind Japanese lines much of the time. They set up their mobile operating theater wherever it was needed most, responding quickly to the call of army commanders. Unfortunately, in 1939, he died of blood poisoning from a cut he received while performing surgery. In the 1960s, in order to memorialize Dr. Bethune's sacrifice, Chairman Mao published his essay entitled “In Memory of Norman Bethune,” which documented the final months of the doctor's life in China. Since then, many Chinese people have learned about the spirit of absolute selflessness by reading about Dr. Bethune, who showed that everyone can be very useful to society. 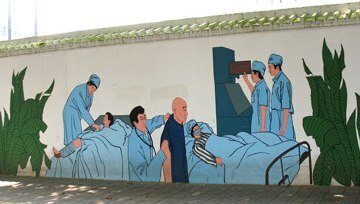 The final section of this mural shows Dr. Bethune working in the shadow of the First Affiliated Hospital of Kunming Medical University. Kunming Medical University (KMU) has a deep affinity with Doctor Bethune because the university's first Assistant Dean, Yan Yi-quan, was Dr. Bethune's medical assistant during a battle in China's fight against Japanese aggression. In 1938, working as a military doctor, Yan Yi-quan met and had a chance to work with this outstanding Canadian doctor. Unfortunately, in 1939, Dr. Bethune sacrificed his life to save a wounded soldier. Although Dr. Bethune passed away, his spirit about caring for patients with all his heart and soul had been deeply planted in Dr. Yan's heart. After the victory in that war, Dr. Yan spared no effort in his practice of medicine to improve the whole nation's lifestyle. Later when Dr. Yan worked at KMU, he took the spirit of Dr. Bethune seriously when instructing and managing the students. Many of the interns who have served in KMU's #1 Affiliated Hospital heard Dr. Yan say that just as Dr. Bethune was a man who had a magnificent character and selfless dedication, medical students should try to be perfect doctors for the remainder of their lives. This resource was created for and by our students under my understanding of "fair use" for educational resources. I apologize if the students plagiarized from other sources without telling me! As far as I am concerned, people are allowed to print/copy it for personal or classroom use. If you print/use this, please see Website Standards and Use Policy for things posted at www.krigline.com and www.krigline.com.cn.